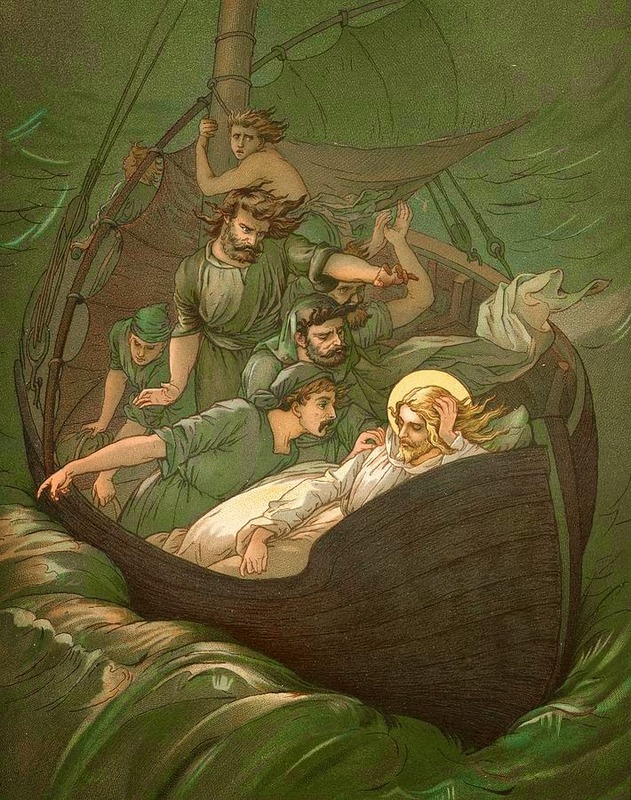 We were invited to imaginatively engage the words of the text in different ways during each reading—imagining the scene, imagining ourselves in the scene, and imagining ourselves in conversation with Christ during the scene. I usually find Lectio Divina to be powerful, but I rarely find myself really imagining myself in the story. I usually find comfort in the words and consolation in the quietness and slowness of the practice, but I rarely find myself emotional. But this time, by actually imagining myself in the scene and imaginatively bringing my story in conversation with God's story, I found myself emotional... even angry. Why angry? Why not comforted and relieved? After all, it is a story of Jesus calming a storm! Shouldn't the story have calmed my heart? I couldn't help but relate the story to my current situation. Jesus said, "let's go to the other side... Let's go to Princeton Seminary." Looking at the clouds over the sea, it didn't take a meteorologist to know that a storm was gonna hit us. But Jesus said to do it, so here we are. And when the storm hits... when I realize that my expenses vastly exceed my income, when my wife who makes the money gets pregnant, when my calling into ministry gets tossed into the air and I can't figure out how or where it's going to land, when all my insecurities hit me like waves breaking over my boat, threatening to sink me... Jesus is arrogantly sleeping on a cushion. And when I finally call out to him for a little help with the situation, he has the nerve to act like I'm doing something wrong. He's the one who called me out here! And I can't help but see his act of rebuking the wind and calming the waters as an act of sheer arrogance and insensitivity... as though he's brushing my concerns aside and writing me off as a faithless person. The truth is, as the story was read, I couldn't even take the calming part seriously... I couldn't get past the part where I was sinking and Jesus was sleeping. I was stuck in the moment where I was shaking Jesus from his precious sleep... and I just wanted to hit him. I was angry because it feels like I'm sinking right now. And it doesn't matter what's on the other side if we sink before we get there. If nothing else, this practice helped me to see something about myself, something about my relationship with God that I might not—almost definitely would not—have seen otherwise. It created a space for my humanity, my anger, my frustration before God—a place for my anxiety to be held before God in honesty where, as I would discover, it would not destroy me. Did I find resolution? Not really. Did I get a response from God as I named my frustration? I wouldn't say so. But I found something in myself I might not have known existed and even in this space which feels like God-forsakenness, I have room to hope—I've been given permission to hope—that God might calm the storm in me. I guess that my point in sharing this experience is not only for my own processing of it, but also to demonstrate the importance of spiritual practice and formation in Christian education. The text is not only supposed to be studied as an object in a lab. There are more subjective ways of learning from the scriptures, more experiential ways to hear from God. You can't separate, altogether, the practice of Christian spirituality from Christian education because some things just can't be learned with only a brain. Would I have learned what I learned had I simply exegeted the passage, read some commentaries, and did some word studies? I can say, with some confidence, I wouldn't have.